What is the Gaye-Holud ceremony? Gaye holud is a ceremony observed mostly in the region of Bengal (comprising Bangladesh and Indian West Bengal). It is part of an elaborate series of celebrations constituting the Bengali wedding. 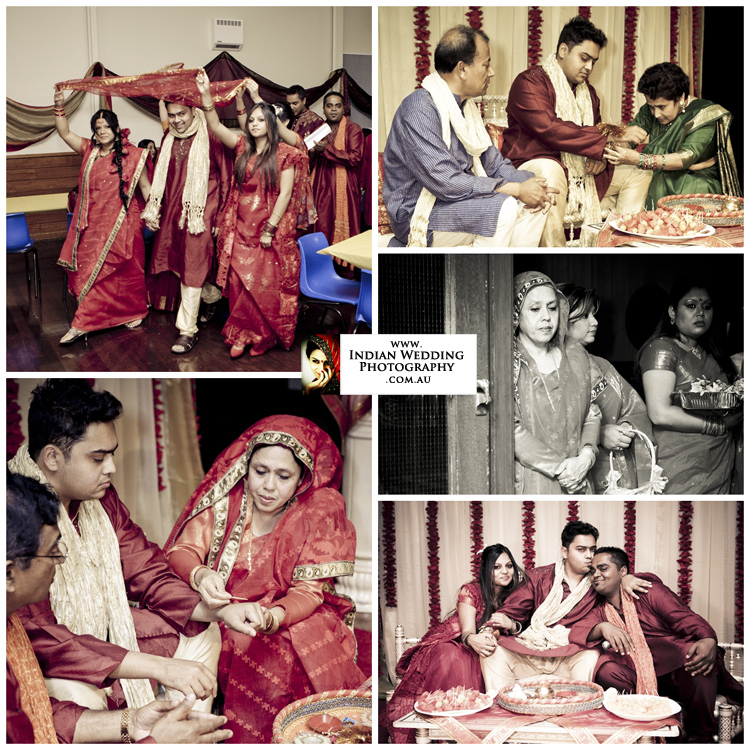 The gaye holud takes place one or two days prior to the religious and legal Bengali wedding ceremonies. The gaye holud may be a joint event for the bride and groom's families, or it may consist of separate events for the bride's family and the groom's family. For the bride's gaye holud, the groom's family - minus the groom himself - go in procession to the bride's home. They carry with them the bride's wedding outfit and jewelry, wedding decorations such as the turmeric paste and henna, cosmetics, sweets and other gifts. They may also bring fresh fish dressed as a wedding couple, or desserts molded to resemble fish. The procession traditionally centers on the bride's (younger) female relatives and friends, who traditionally dress in matching clothes. 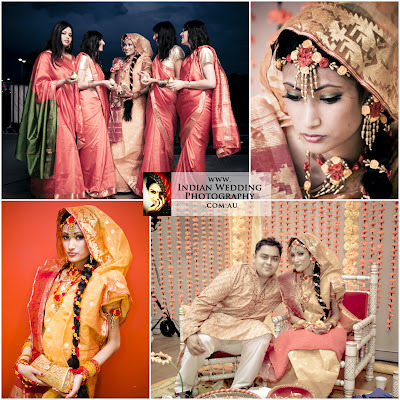 The bride, her attendees, and all the guests traditionally wear red, yellow, orange, or green clothing. Nowadays, other colours may be permitted for gaye holud guests. The guests then enjoy a feast, including music, dance and some performances, arranged by the bride's family. The groom's family members often bring fish decorated as a wedding couple to the bride's gaye holud. The bride is seated on a dais, and the henna is used to decorate her hands and feet with elaborate abstract designs. The turmeric paste is applied by the guests to her face and body. Tumeric is known to cleanse, soften and brighten the skin, giving the bride's skin the distinctive yellow hue that gives its name to this ceremony. The sweets are then fed to the bride by all the guests and attendants, piece by piece. The groom's gaye holud comes next, and has the same form as the bride's holud ceremony. In this ceremony, the bride does not participate. The groom is accompanied by his younger male relatives and friends, and as with the bride's ceremony, the guests traditionally wear red, yellow, green, or orange clothing. The bride's family brings the gifts for the groom (usually the wedding outfit and some grooming items, along with the tumeric and other gifts) to his house. The guests exchange sweets with and apply turmeric paste to the groom, and a feast (with food, music, dance, and various cultural performances) is arranged for the guests from the groom's family. Unlike the bride, the groom does not get henna applied to his body; henna is only applied to the bride and perhaps also some of her younger female attendants. Although similar ceremonies exist in other parts of the Indian subcontinent, the gaye holud is a custom particular to the Bengali people. It is not considered a religious function, as it is celebrated by Muslims, Hindus, and Christians in both Bangladesh and Indian West Bengal. Although it is considered a part of the Bengali wedding tradition, the couple is not considered married at the end of the gaye holud. There is no legal marriage performed during this ceremony. Unlike the wedding ceremonies, the gaye holud is not a formal or extravagant event; both guests and bridal party members dress more simply and decorate the venue less intricately than at the wedding ceremonies.